IT WOULD HARDLY be possible for me to put into words how much Our Lady thinks of the Holy Rosary and of how she vastly prefers it to all other devotions. Neither can I sufficiently express how highly she rewards those who work to preach the devotion, to establish it and spread it, nor on the other hand how firmly she punishes those who work against it. All during life, Saint Dominic had nothing more at heart than to praise Our Lady, to preach her greatness and to inspire everybody to honor her by saying her Rosary. As a reward he received countless graces from her; exercising her great power as Queen of Heaven she crowned his labors with many miracles and prodigies. Almighty God always granted him what he asked through Our Lady. The greatest honor of all was that she helped him crush the Albigensian heresy and made him the founder and patriarch of a great religious order. As for Blessed Alan de la Roche who restored the devotion to the Rosary, he received many privileges from Our Lady; she graciously appeared to him several times to teach him how to work out his salvation, to become a good priest and perfect religious, and how to pattern himself on Our Lord. 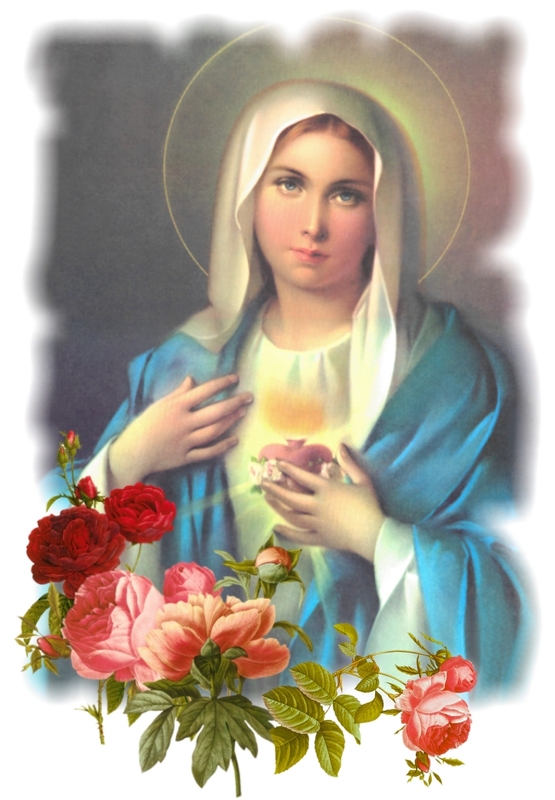 He used to be horribly tempted and persecuted by devils, and then deep sadness would fall upon him and sometimes he used to be near to despair----but Our Lady always comforted him by her sweet presence which banished the clouds of darkness from his soul. She taught him how to say the Rosary, explaining its value and the fruits to be gained by it and gave him a great and glorious privilege: the honor of being called her new spouse. As a token of her chaste love for him she placed a ring upon his finger and a necklace made of her own hair about his neck and gave him a Rosary. Father Triteme, Carthagena and Martin of Navarre (both very learned men) and others as well have spoken of him in terms of the highest praise. Blessed Alan died at Zunolle in Flanders September 8th, 1475, after having brought over one hundred thousand people into the Confraternity. "Do not be afraid, Thomas my son, here I am and I am going to save you: get up now and go on preaching my Rosary as you used to do. I promise to shield you from your enemies." When Our Lady said this the devil fled and Blessed Thomas got up, finding that he was in perfect health. He then thanked the Blessed Mother with tears of joy. He resumed his Rosary apostolate and his sermons were marvelously successful. Our Lady blesses not only those who preach her Rosary, but she highly rewards all those who get others to say it by their example. Alphonsus, King of Leon and Galicia, very much wanted all his servants to honor the Blessed Virgin by saying the Rosary. So he used to hang a large rosary on his belt and always wore it, but unfortunately never said it himself. Nevertheless his wearing it encouraged his courtiers to say the Rosary very devoutly. One day the King fell seriously ill and when he was given up for dead he found himself, in a vision, before the judgment seat of Our Lord. Many devils were there accusing him of all the sins he had committed and Our Lord as Sovereign Judge was just about to condemn him to Hell when Our Lady appeared to intercede for him. She called for a pair of scales and had his sins placed in one of the balances whereas she put the Rosary that he had always worn on the other scale, together, with all the Rosaries that had been said because of his example. It was found that the Rosaries weighed more than his sins. Looking at him with great kindness Our Lady said: "As a reward for this little honor that you paid me in wearing my Rosary, I have obtained a great grace for you from my Son. Your life will be spared for a few more years. See that you spend these years wisely, and do penance." When the King regained consciousness he cried out: "Blessed be the Rosary of the Most Holy Virgin Mary, by which I have been delivered from eternal damnation!" After he had recovered his health he spent the rest of his life in spreading devotion to the Holy Rosary and said it faithfully everyday. People who love the Blessed Virgin ought to follow the example of King Alphonsus and that of the Saints whom I have mentioned so that they too may win other souls for the Confraternity of the Holy Rosary. They will then receive great graces on earth and eternal life later on. "They that explain me shall have life everlasting." [Ecclus. 24:31.